Oklahoma Farm Report - In this Month's Cattle on Feed Report- How Low Will Placements Go? In this Month's Cattle on Feed Report- How Low Will Placements Go? Cattle on Feed numbers will be released on Friday afternoon, April 20, at 2:00 PM central time. As is often the case, placement numbers will be focal point of this monthly report that details how many cattle are in the nation's feedlots. 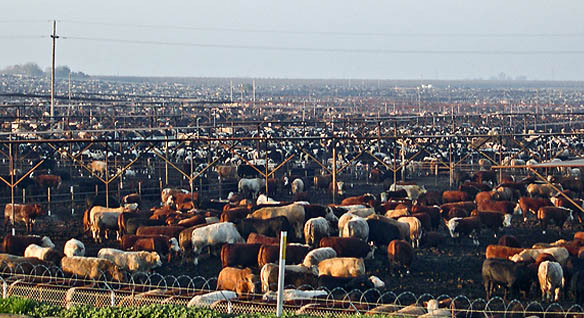 According to numbers compiled by Dow Jones, the pre report average guess as to the number of cattle in the nation's feedlots is 102% of one year ago- comparing April first 2012 to April First of 2011. The Pre Report guess on placements is an average of 92.3% this year vesus last year- based on March placements. Marketings are also expected to be well under 2011, with a pre report average guess of about five percent less than in 2011. One of the most aggresive numbers on placements comes from the Livestock Market Information Center, as they are calling for an eleven percent drop in placements in March 2012 versus March 2011. On today's Beef Buzz, we hear from Jim Robb of the LMIC, as he explains why he believes the number of cattle entering feedlots was so much lower this year versus 2011. Robb's comments come courtesy of Agriculture Today, as produced by the K-State Radio Network.